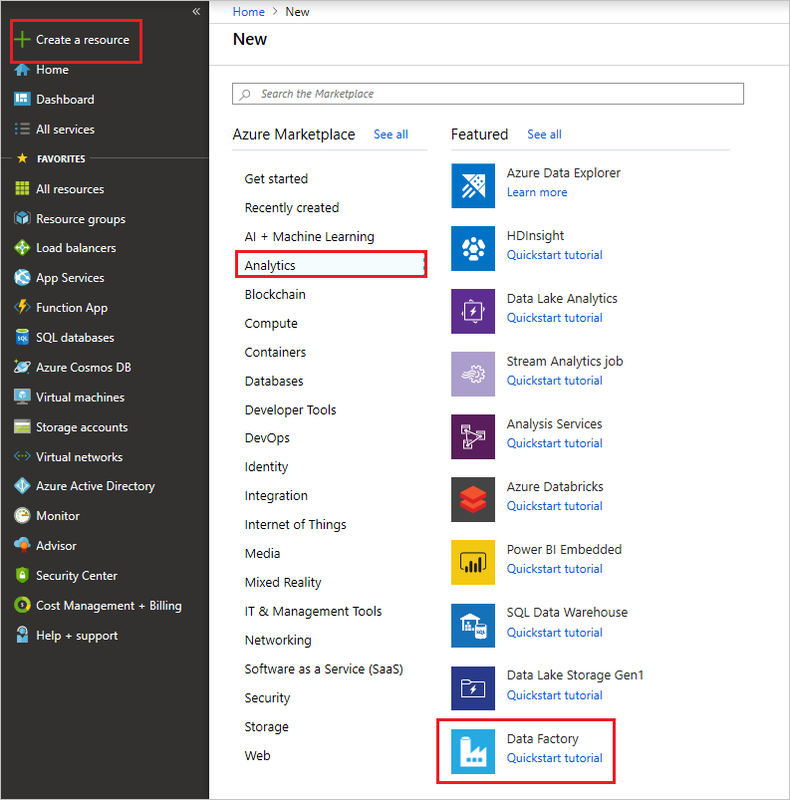 In this tutorial, you create a data factory by using the Azure Data Factory user interface (UI). 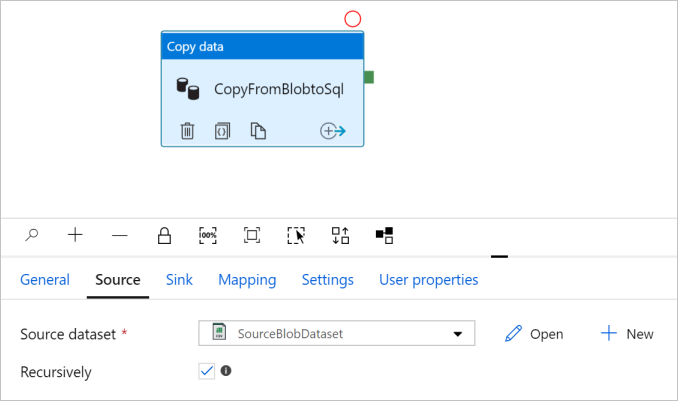 The pipeline in this data factory copies data from Azure Blob storage to a SQL database. 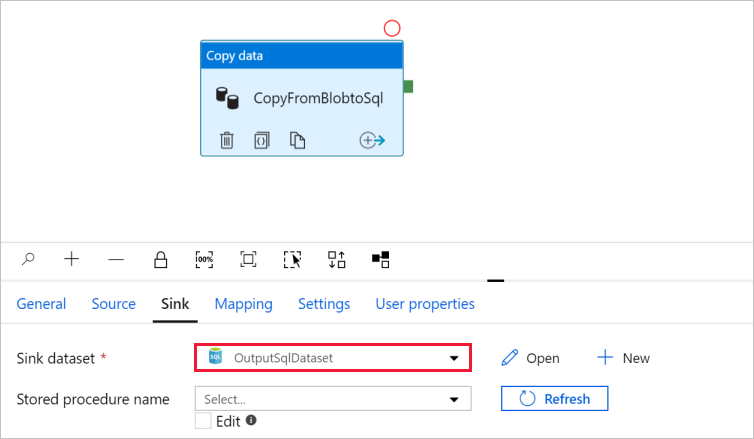 The configuration pattern in this tutorial applies to copying from a file-based data store to a relational data store. For a list of data stores supported as sources and sinks, see the supported data stores table. 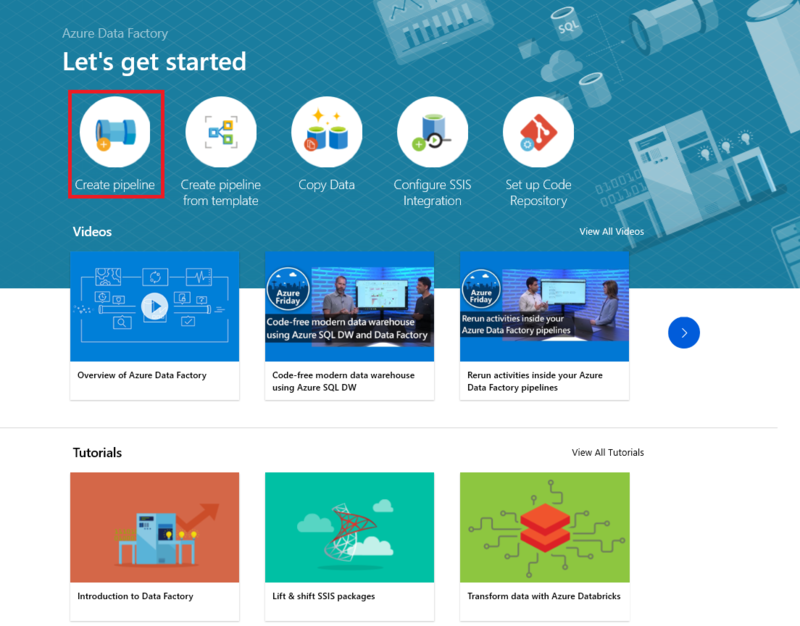 If you're new to Data Factory, see Introduction to Azure Data Factory. Create a pipeline with a copy activity. Trigger the pipeline on a schedule. Monitor the pipeline and activity runs. Azure subscription. If you don't have an Azure subscription, create a free Azure account before you begin. Azure storage account. You use Blob storage as a source data store. 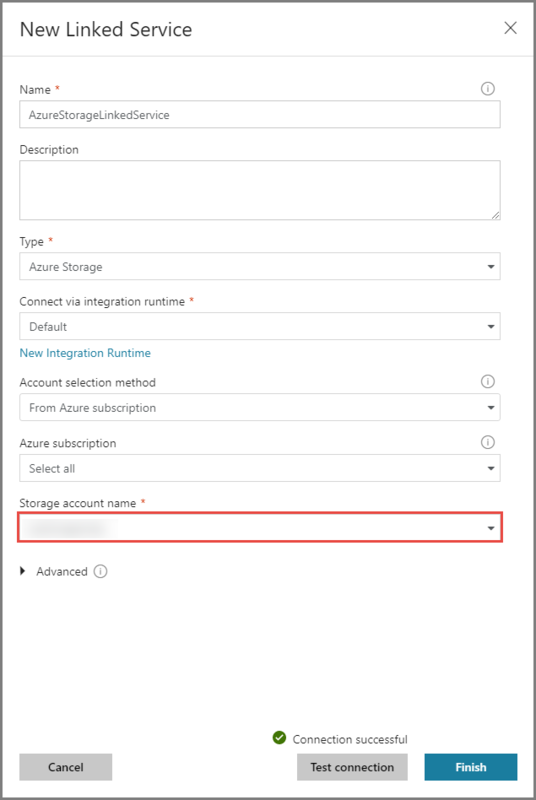 If you don't have a storage account, see Create an Azure storage account for steps to create one. Azure SQL Database. You use the database as a sink data store. If you don't have a SQL database, see Create a SQL database for steps to create one. Now, prepare your Blob storage and SQL database for the tutorial by performing the following steps. Create a container named adftutorial in your Blob storage. Create a folder named input in this container. Then, upload the emp.txt file to the input folder. 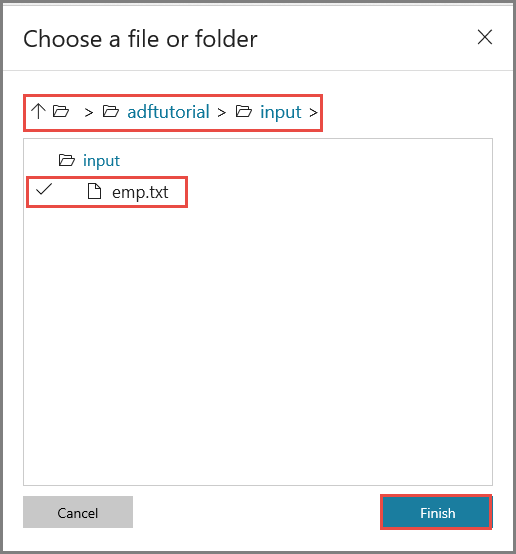 Use the Azure portal or tools such as Azure Storage Explorer to do these tasks. a. On the left, select More services > SQL servers. b. Select your server, and under SETTINGS select Firewall. c. On the Firewall settings page, select ON for Allow access to Azure services. In this step, you create a data factory and start the Data Factory UI to create a pipeline in the data factory. Open Microsoft Edge or Google Chrome. Currently, Data Factory UI is supported only in Microsoft Edge and Google Chrome web browsers. 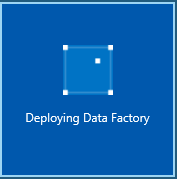 On the New data factory page, under Name, enter ADFTutorialDataFactory. The name of the Azure data factory must be globally unique. If you see the following error message for the name field, change the name of the data factory (for example, yournameADFTutorialDataFactory). For naming rules for Data Factory artifacts, see Data Factory naming rules. 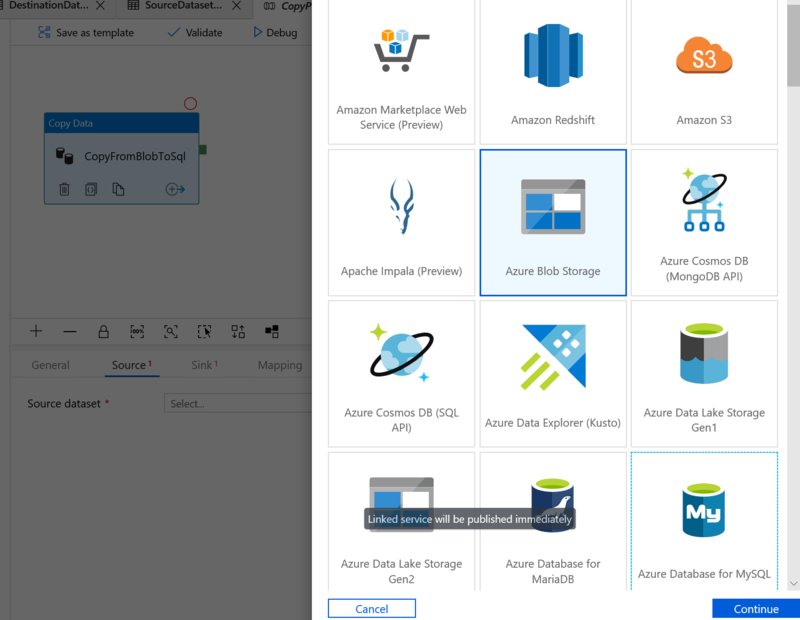 Select the Azure subscription in which you want to create the data factory. a. Select Use existing, and select an existing resource group from the drop-down list. b. Select Create new, and enter the name of a resource group. To learn about resource groups, see Use resource groups to manage your Azure resources. Under Location, select a location for the data factory. Only locations that are supported are displayed in the drop-down list. 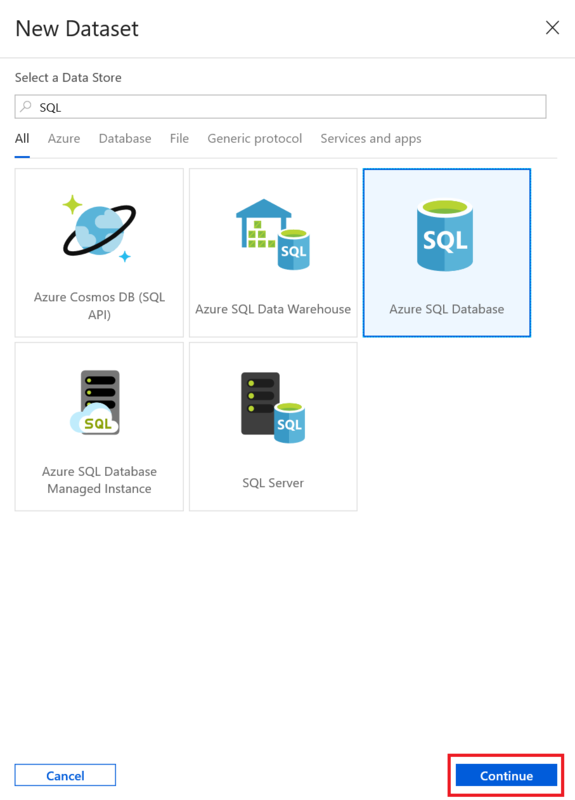 The data stores (for example, Azure Storage and SQL Database) and computes (for example, Azure HDInsight) used by the data factory can be in other regions. After the creation is finished, you see the Data factory page as shown in the image. 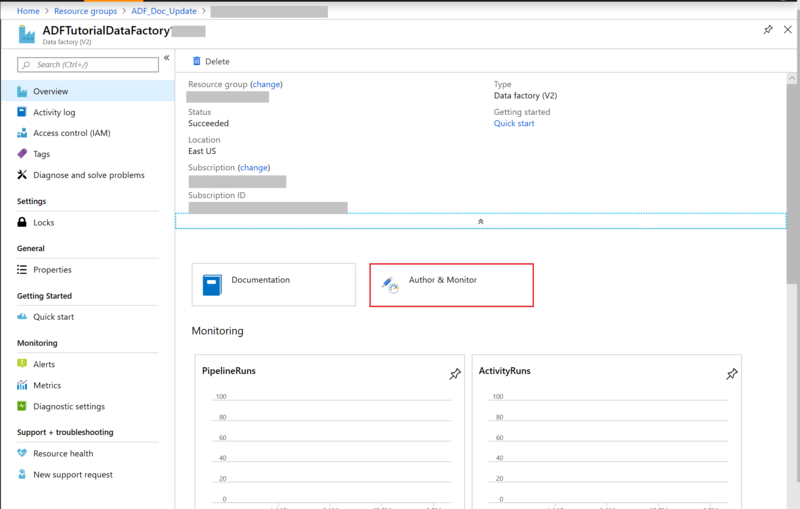 Select Author & Monitor to launch the Data Factory UI in a separate tab. Create input and output datasets. In this tutorial, you start with creating the pipeline. Then you create linked services and datasets when you need them to configure the pipeline. On the Let's get started page, select Create pipeline. In the General tab for the pipeline, enter CopyPipeline for Name of the pipeline. 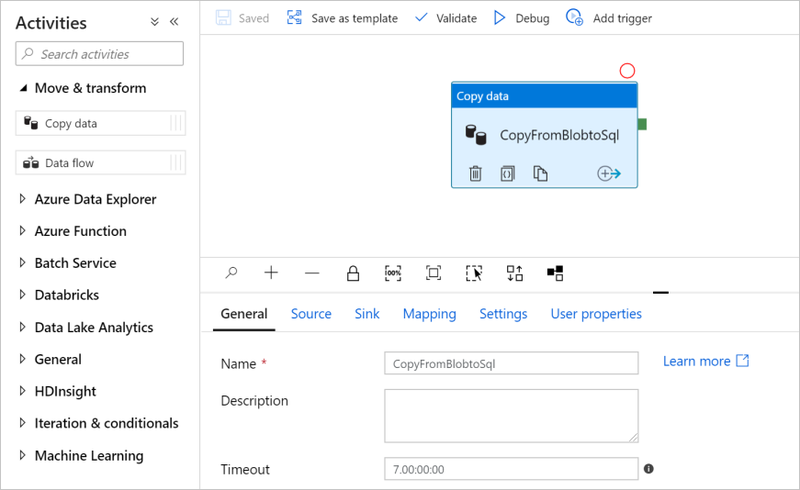 In the Activities tool box, expand the Move andTransform category, and drag and drop the Copy Data activity from the tool box to the pipeline designer surface. Specify CopyFromBlobToSql for Name. Go to the Source tab. Select + New to create a source dataset. 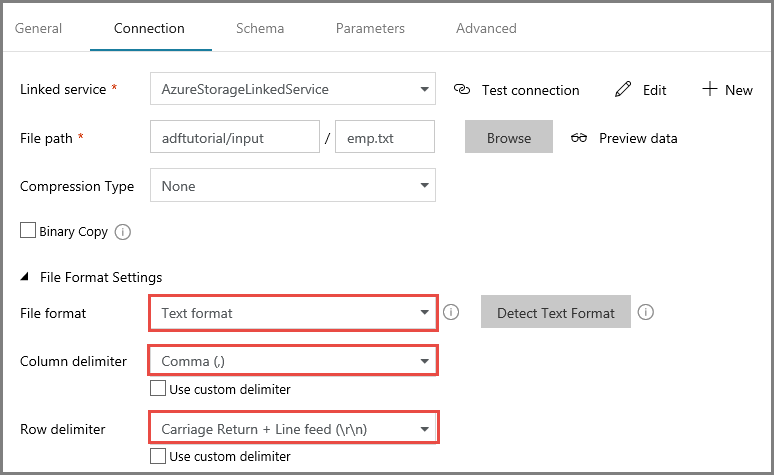 In the New Dataset window, select Azure Blob Storage, and then select Finish. 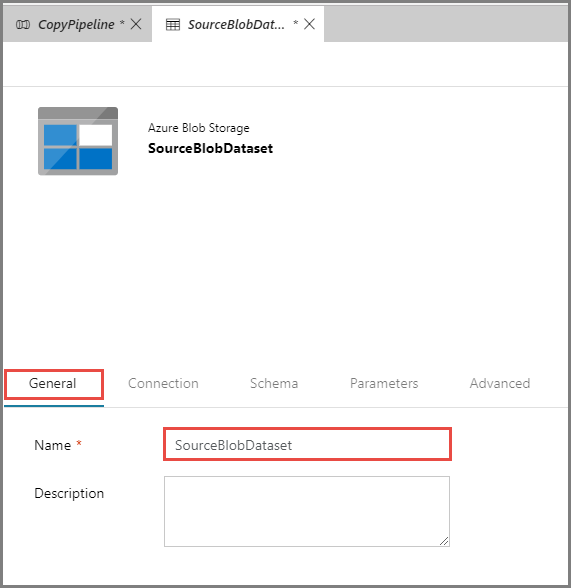 The source data is in Blob storage, so you select Azure Blob Storage for the source dataset. You see a new tab opened for blob dataset. On the General tab at the bottom of the Properties window, enter SourceBlobDataset for Name. Go to the Connection tab of the Properties window. Next to the Linked service text box, select + New. 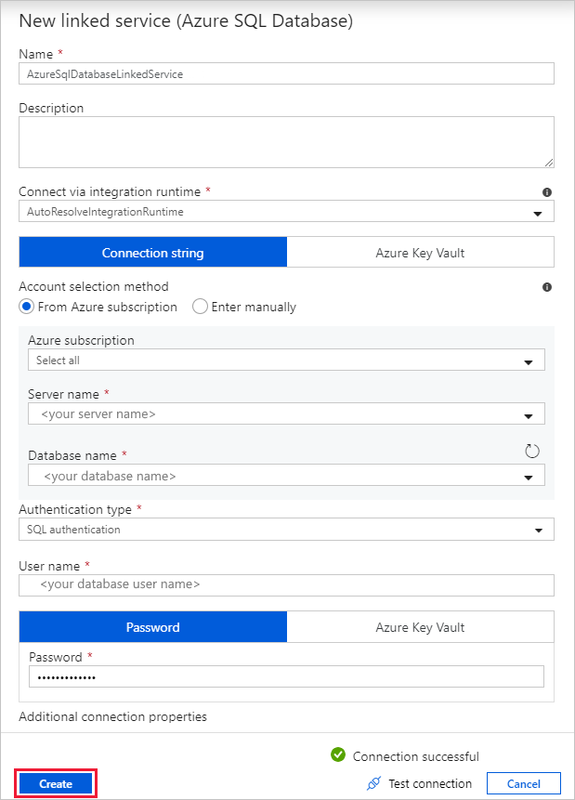 In the New Linked Service window, enter AzureStorageLinkedService as name, select your storage account from the Storage account name list, then select Save to deploy the linked service. After the linked service is created, you are back in the dataset settings. Next to File path, select Browse. Navigate to the adftutorial/input folder, select the emp.txt file, and then select Finish. Confirm that File format is set to Text format and that Column delimiter is set to Comma (,). If the source file uses different row and column delimiters, you can select Detect Text Format for File format. The Copy Data tool detects the file format and delimiters automatically for you. You can still override these values. To preview data on this page, select Preview data. Go to the Schema tab of the Properties window, and select Import Schema. Notice that the application detected two columns in the source file. You import the schema here so that you can map columns from the source data store to the sink data store. If you don't need to map columns, you can skip this step. For this tutorial, import the schema. Now, go back to the pipeline -> Source tab, confirm that SourceBlobDataset is selected. To preview data on this page, select Preview data. Go to the Sink tab, and select + New to create a sink dataset. 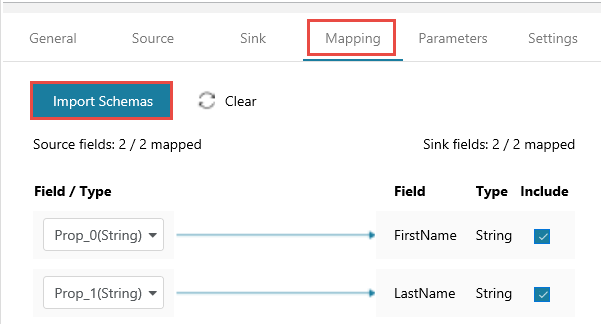 In the New Dataset window, input "SQL" in the search box to filter the connectors, then select Azure SQL Database, and then select Finish. In this tutorial, you copy data to a SQL database. On the General tab of the Properties window, in Name, enter OutputSqlDataset. Go to the Connection tab, and next to Linked service, select + New. A dataset must be associated with a linked service. The linked service has the connection string that Data Factory uses to connect to the SQL database at runtime. The dataset specifies the container, folder, and the file (optional) to which the data is copied. a. Under Name, enter AzureSqlDatabaseLinkedService. b. Under Server name, select your SQL Server instance. c. Under Database name, select your SQL database. d. Under User name, enter the name of the user. e. Under Password, enter the password for the user. f. Select Test connection to test the connection. g. Select Save to save the linked service. Go to the Schema tab, and select Import Schema. Select the ID column, and then select Delete. The ID column is an identity column in the SQL database, so the copy activity doesn't need to insert data into this column. Go to the tab with the pipeline, and in Sink Dataset, confirm that OutputSqlDataset is selected. Go to the Mapping tab at the bottom of the Properties window, and select Import Schemas. Notice that the first and second columns in the source file are mapped to FirstName and LastName in the SQL database. To validate the pipeline, select Validate from the tool bar. You can see the JSON code associated with the pipeline by clicking Code on the upper-right. 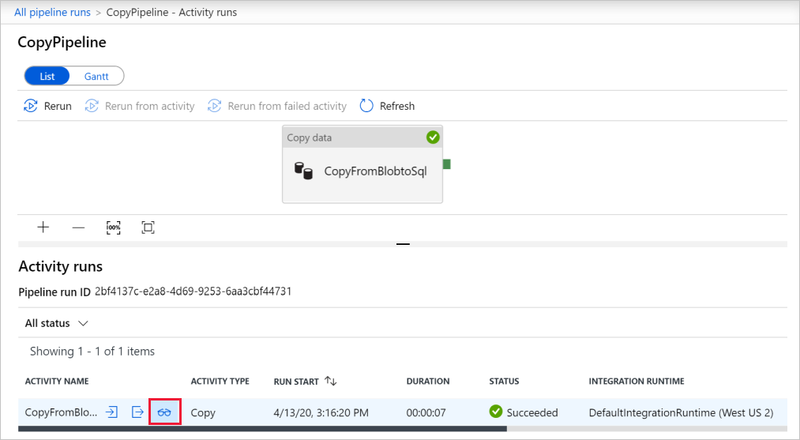 You can debug a pipeline before you publish artifacts (linked services, datasets, and pipeline) to Data Factory or your own Azure Repos Git repository. To debug the pipeline, select Debug on the toolbar. You see the status of the pipeline run in the Output tab at the bottom of the window. Once the pipeline can run successfully, in the top toolbar, select Publish All. This action publishes entities (datasets, and pipelines) you created to Data Factory. Wait until you see the Successfully published message. To see notification messages, click the Show Notifications on the top-right (bell button). In this step, you manually trigger the pipeline you published in the previous step. Select Trigger on the toolbar, and then select Trigger Now. On the Pipeline Run page, select Finish. Go to the Monitor tab on the left. You see a pipeline run that is triggered by a manual trigger. You can use links in the Actions column to view activity details and to rerun the pipeline. To see activity runs associated with the pipeline run, select the View Activity Runs link in the Actions column. In this example, there is only one activity, so you see only one entry in the list. For details about the copy operation, select the Details link (eyeglasses icon) in the Actions column. Select Pipelines at the top to go back to the Pipeline Runs view. To refresh the view, select Refresh. Verify that two more rows are added to the emp table in the SQL database. In this schedule, you create a schedule trigger for the pipeline. The trigger runs the pipeline on the specified schedule, such as hourly or daily. 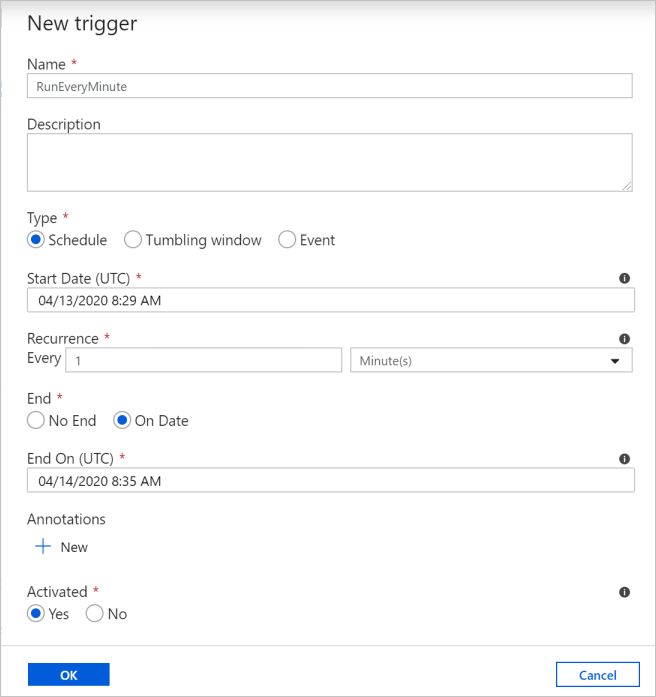 In this example, you set the trigger to run every minute until the specified end datetime. Go to the Author tab on the left above the monitor tab. Go to your pipeline, click Trigger on the tool bar, and select New/Edit. In the Add Triggers window, select Choose trigger, and then select + New. a. Under Name, enter RunEveryMinute. b. 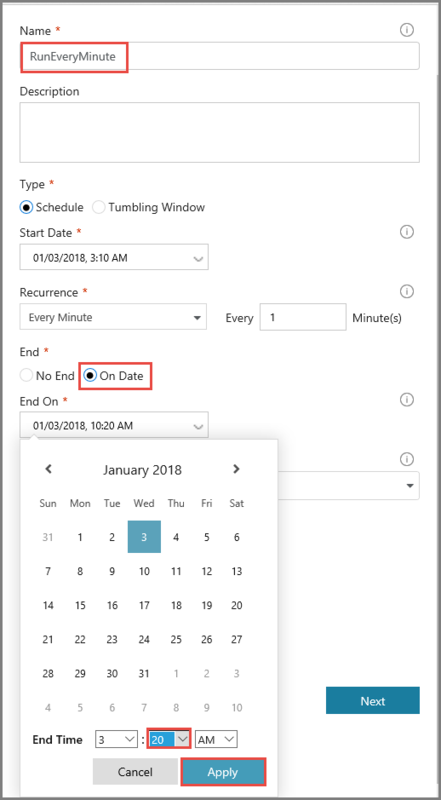 Under End, select On Date. c. Under End On, select the drop-down list. d. Select the current day option. By default, the end day is set to the next day. e. Update the minutes part to be a few minutes past the current datetime. The trigger is activated only after you publish the changes. If you set it to only a couple of minutes apart and you don't publish it by then, you don't see a trigger run. g. Select the Activated option. You can deactivate it and activate it later by using this check box. A cost is associated with each pipeline run, so set the end date appropriately. On the Trigger Run Parameters page, review the warning, and then select Finish. The pipeline in this example doesn't take any parameters. Click Publish All to publish the change. Go to the Monitor tab on the left to see the triggered pipeline runs. 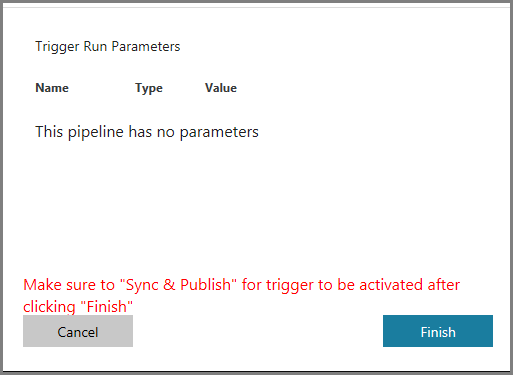 To switch from the Pipeline Runs view to the Trigger Runs view, select Pipeline Runs and then select Trigger Runs. You see the trigger runs in a list. Verify that two rows per minute (for each pipeline run) are inserted into the emp table until the specified end time.